Les Namingha (Hopi/Zuni Pueblos, b. 1968), Polychrome Seed Jar, 2005. Clay, sand temper, mineral paint, carbon paint. 10 × 10 × 5 in. Gift of Carol Warren, MIAC 59720/12. Photograph by Addison Doty. How do skill, talent, and creativity run through New Mexico’s Native families of artists? When you visit What’s New in New: A Selection from the Carol Warren Collection, you won’t just experience a survey of the best in contemporary pottery rarely seen in one place at one time. You’ll also be able to notice the way family connections express themselves in the assembled works. 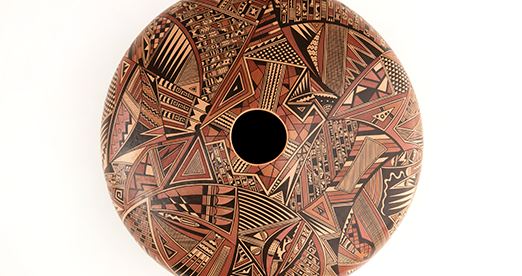 The show consists of pieces from Warren’s significant donation of contemporary works of Native art: mostly pottery, but also painting, sculpture, and jewelry. Artists represented include Tony Abeyta, Autumn Borts-Medlock, Preston Duwyenie, Tammy Garcia, Dan Namingha, Les Namingha, Jody Naranjo, and Roxanne Swentzell. Warren has had a discerning eye since she began collecting in 1990, when, at a gallery in New York, she purchased a small Native-made pot signed JN. She didn’t know until later that it was made by Jody Naranjo. It didn’t matter—she loved the pot and wanted it in her home. Tito Naranjo (Santa Clara Pueblo), Figure of Clown with Child, 2001. Micaceous clay, slip. 11 × 7 × 6 2/3 in. Gift of Carol Warren, MIAC 59816/12 a, b. Photograph by Ross Altshuler. Tammy Garcia (Santa Clara Pueblo), Element III, ca. 2007. Cast glass. 16 × 14 1⁄2 × 3 in. Gift of Carol Warren, MIAC 59730/12. Photograph by Addison Doty. Autumn Borts-Medlock (Santa Clara Pueblo) and Linda Cain (Santa Clara Pueblo), Ceramic Seed Jar, 1989. Clay with micaceous slip. 3 1⁄2 × 4 in. Gift of Carol Warren, MIAC 59720/12. Photograph by Ross Altshuler. One year later, she moved to Santa Fe, and immediately immersed herself in Native arts and culture. Warren became a volunteer at the MIAC museum shop and worked there for 26 years, and volunteered in the museum’s collections department for 19 years. Though she sometimes purchased from dealers and the MIAC Museum Shop, Warren developed personal connections with the artists she chose to collect. After she decided to donate her collection to MIAC, she began to consider what was needed to enhance the museum’s collections. As a result, the pieces included in her collection reflect her own tastes and aesthetic, coupled with a careful nod toward legacy and historic preservation. Tammy Garcia typically creates less than ten clay pots each year. Garcia also expresses similar themes in works of bronze, glass, and jewelry. Garcia has cast lead crystal into a solid three-dimensional sculpture of a water symbol found on ancestral Pueblo pottery. Referring to this and other motifs, she has said, “These are fragments of design taken from Anasazi pottery—powerful symbols for the nourishing quality of water. On their deeper meaning, they represent eternal life.” Garcia is a descendant of Margaret Tafoya’s sister Christine, and learned the basics of pottery-making from her mother Linda Cain, and her grandmother, Mary Cain. Her sister, Autumn Borts-Medlock, is also represented in this exhibition. Les Namingha is a scion of the great Hopi potter Nampeyo of Hano. He is a cousin of Dan Namingha, whose mother, Dextra Quotskuyva, taught Namingha pottery making. His family is known for their innovative approach to pottery, and Namingha continues to build on that legacy. Like his teacher and his family in general, Namingha has become renowned as an innovator. The small, tightly detailed painted surface sets this pot apart. On the top half, you can see a mixture of Sikyátki and ancient Puebloan designs such as birds, feathers, lightning and kiva steps. The checkerboard represents rain, and the fine line section represents turquoise. Just below the shoulder is stippling within geometric shapes, representing pottery sherds. Radiating from the bottom is an eight-pointed star interspersed with rows of small motifs including clouds, water, feathers, and a katsina face. 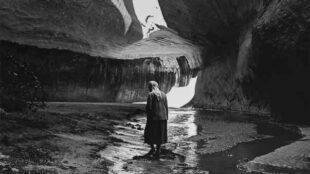 What’s New in New: Selections from the Carol Warren Collection can be seen from June 3 through February 26, 2019 in the Lloyd Kiva New Gallery at MIAC. The show was curated by C.L. Kieffer, collections manager of archaeological research collections. Ross Altshuler was co-author of the Turquoise, Water, Sky exhibition catalog, and is a contractor at MIAC, helping with the revision of the permanent Here, Now and Always exhibition.